A-29 Super Tucano aircraft have flown hundreds of close-air support and training missions since January. 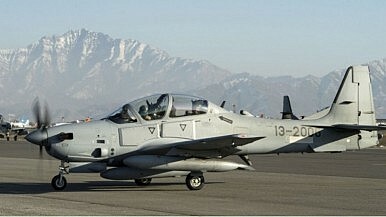 The Afghan Air Force (AAF) has flown hundreds of close-air support and training missions with their new Embraer/Sierra Nevada Corporation A-29 Super Tucano light attack aircraft, NATO’s Resolute Support headquarters in Kabul said in statement published by the website military.com. The first four out of twenty A-29 aircraft became operational on April 1 and purportedly conducted their first attack missions in the first and second week of April, according to U.S. military personnel. “They are beginning to take their first strikes,” a U.S. military spokesman said in a video briefing last month. According to IHS Jane’s Defense Weekly, the first confirmed A-29 combat sortie was conducted in Afghanistan’s northeastern province of Badakhshan on April 15. Three airstrikes were conducted in the Khostak valley during a night sortie killing a total of 12 including three insurgent commanders. The mission was launched from Kabul. As I reported previously (See: “First 4 A-29 Light Attack Aircraft Arrive in Afghanistan”), the four A-29 arrived on January 15 at Hamid Karzai International Airport in Kabul. Another four aircraft arrived on March 29. The remaining eight will be handed over to the AAF by the end of 2018. The United States Air Force is spending a total of $427 million under its so-called Light Air Support program to fund the new AAF aircraft. “The A-29 Super Tucano is a turboprop aircraft specifically designed for counter-insurgency operations and can be equipped with a wide array of bombs (including precision guided munitions) and machine guns,” I explained previously. The aircraft is fairly cheap to operate with one hour of flying time costing around $1,000. Overall, the induction of the A-29 light attack aircraft will bring the ANDSF a step closer to becoming a more professional fighting force. However, we should not expect that the new planes will be able to reverse overall battlefield failures and the aircraft will certainly not be capable of guaranteeing battlefield successes on its own. Until now, Afghanistan’s new A-29 light attack aircraft have only been using unguided bombs against Taliban targets.